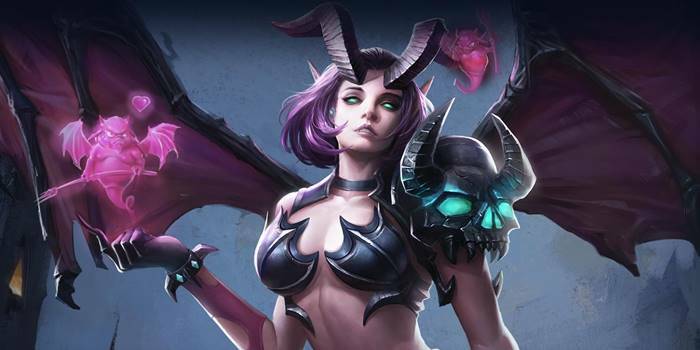 Samurai Gamers bring you a hero guide on Veera, a high-damage mage in Arena of Valor. Includes how to play, strategies, and pro item builds. Veera is a mage that excels at dealing massive amounts of damage to enemies. Her kit is centered around dealing high amounts of damage to targets. She is an easy champion to play with and therefore a good choice for players new to the game. Powerful Burst Damage – Veera’s abilities can deal a lot of damage very quickly. Chaining the abilities together will almost guarantee a kill when facing squishier targets. Easy to Land Abilities – All of her abilities are easy to land. Inferno Bats, her ultimate, only requires you get close to enemies in order to cast it. Mesmerize is a single-target stun that can perfectly set up her abilities while Hell Bats has a long range and wide projectile. Hard to Approach – Given her guaranteed stun in Mesmerize, it can be very difficult for opponents to approach. After stunning the enemy, Veera can then hit them with her full combo for an easy kill. This can be a big problem for junglers or squishier foes in team fights, having to rely on organized strikes to take her out. Low Mobility – Veera has no movement abilities to help her escape sticky situations. Her only way to stop someone, Mesmerize, is limited to a single enemy, so she can have trouble if kited or ganged up on. Very Squishy – Her magic damage comes at a cost to her armor and defense. Assassins and champions with strong finishers will have little problem dealing with her in team fights. As a mage, Veera is best suited to the mid lane. Mesmerize makes her adept at both ganking and dueling, making it a natural choice. Harassing the enemy is important during the laning phase. Keep using Hell Bat on them until they recall back or be forced to use heal. Save Mesmerize for if your laning opponent tries to engage or another enemy comes to gank your lane. This ability can only target one hero, so use it wisely. Once you get Inferno Bats, you will have the option to kill enemies with a Mesmerize + Hell Bat + Inferno Bats combo. Start with Hell Bat when you are alone in a lane. Mesmerize is a good ability when laning with an ally as it stuns enemies, giving your lane partner an opening. Always max Hell Bat first regardless of which ability you took at level one. It is Veera’s main source of damage and is critical in fights. Solo Fights: Targets should be dealt with by quickly comboing Mesmerize, Hell Bat, and Inferno Bats. If this isn’t enough to burst the target down to nothing, start to move towards safety. Hell Bat shouldn’t spend too much time on cooldown, so can be used to finish the target off once ready. Team Fights: Stay at the back of team fights as much as possible. You want to isolate enemies and pick them off solo rather than groups of enemies. This is because Inferno Bats spreads out between targets and thereby lowers Veera’s lethality. Escaping the Battle: Veera has poor mobility and no movement abilities. As such, it is really important that you stay back as much as possible and never go to the front of a battle. Come Hither – Passive – Veera applies a Come Hither stack to every enemy hit by her abilities. Each stack reduces an enemy’s magic defense by 30-72 (scales with hero level), up to 3 stacks. Reduce the current cooldown of all abilities by 25% of the maximum cooldown time after a kill or assist. Come Hither is a very powerful passive that can significantly weaken the enemy’s magic defense. This passive also allows your teammates to deal more magic damage against the affected enemies. It’s best to use Mesmerize first in a team fight in order to decrease the magic defense of the enemy. Follow it up with a Hell Bat and Inferno Bats to finish them off. Hell Bat – Veera summons a Hell Bat that glides forward, dealing 575/625/675/725/775/825 (+1.15 AP)ˀ magic damage to enemies hit. Hell Bat is a damaging ability that can damage multiple enemies in a straight line. This ability can be used to either farm creeps or harass enemy in the laning phase and in team fights. With this ability having a long range, this is very handy when you are trying to kill an escaping enemy. Level up this ability first rather than Mesmerize if you are alone in a lane. This can give you more damage and harass. Mesmerize – Veera blows a kiss at en enemy, dealing 285/320/355/390/425/460 (+0.7 AP) magic damage and stunning the target for 1.5 seconds. Mesmerize is a good opening skill as it decreases the magic defense of your enemy with Come Hither. This can open up a lot of opportunities for you and your teammates to engage. Do take note that this ability has a short range, so don’t overextend to try to use it head-on during a team fight. Mesmerize can be more precisely aimed with the ability wheel. Inferno Bats – Veera summons up to 5 bats to attack surrounding enemies. Each bat deals 325/405/485 (+0.75 AP) magic damage. If a target has been hit once, all subsequent hits only deal 50% damage. Inferno Bats can damage multiple enemies surrounding Veera. This ability requires her to be near an enemy in order to activate. The ability is strong in one on one situations, as all five bats will attack one specific person. However, hits after the first only deal 50% damage. This ability is most effective when you have cast Mesmerize and Hell Bat first, as the enemy will have two stacks of Come Hither on them, greatly strengthening the damage output of Inferno Bats. Veera excels at one on one fights but can’t do well in team fights. Approach her with an ally one she won’t be able properly retaliate. It’s best to get an early advantage against Veera, as she is weak without her core items. Harass her often in order delay her farm and get a gold advantage early. Veera needs mage arcana to make the most of her damage potential. Violate, Devour, and Hex are great for scaling your ability power and magical damage. If you want a safer alternative, you can build her with magic lifesteal and defensive arcanas to bolster her survivability. Violate, Devour, and Consume ensures that she has some options for sustain. Veera can pierce through tanks’ magic defense with the magic pierce that come hither offers, but should generally avoid the beefcakes. She will be a sitting duck if caught by their control abilities. Warriors will be rough, but can be bested if caught by Mesmerise. Only engage them if you are sure that you can finish them off quickly, though as Veera is dead meat if her opponent makes it to melee range. Assassin heroes are very agile and can one shot squishy heroes like Veera with their combos. Saving your Mesmerize for assassin dives can greatly increase your chances of surviving and killing them, though it will be a close contest. Fighting against fellow mages will boil down to the player’s skill level. Since all mages have tremendous magic damage, the winner will be the player who gets to successfully cast their abilities faster. However, Mesmerize might give her an edge against otherwise equally skilled matchups. Veera can easily kill a marksman as long as she gets to cast Mesmerize first to set up her combo. They should be her #1 target, as their absence in a team fight will generally mean a loss for their team. Veera can easily eliminate supports who are alone. When the support has one or more team mates with them, focusing the support may spell danger as they can lock you down as said damage dealer kills you.